‘Shoot for the moon. Even if you miss, you will land among the stars.’ – The popular phrase hold true for 25 year old Sanjay Srikanth Nekkanti, who along with Narayan Prasad and Abhishek Raju, co-founded India’s first startup to design and manufacture satellites in Bangalore in November 2012. Inspired by ISRO’s (Indian Space Research Organisation) Mars mission, Nekkanti started his venture with an aim to privatise the satellite manufacturing space in India. “I and Prasad co-founded Dhruva Space with a primary interest to offer consulting and technology services to university satellite developers in India. In this context, we forged relationships with Noorul Islam University, which is building NIUSAT and People’s Educational Society University, which is building PISAT. We constituted a service contract with Indian Institute of Astrophysics to support their high altitude ballooning programmes with telemetry, tracking and recovery solutions,” reminisces Sanjay Nekkanti, Co-founder and CEO, Dhruva Space. Till date, the startup has been completely bootstrapped through personal savings and funds from friends and family, but the founders are soon looking to raise venture capital in near future. 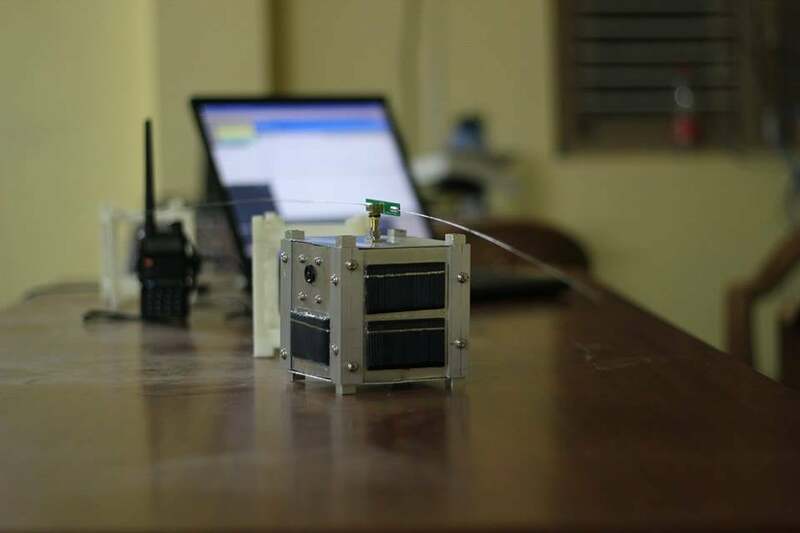 Nekkanti started working on India’s first student built nano-satellite SRMSAT, a Nano satellite built by students at Sri Ramaswamy Memorial University in Chennai, when he was a third year undergraduate student at SRM University. During the early phase of spacecraft development, the students were contemplating on procuring various nano-satellites subsystems from different vendors across the globe and integrating the satellite. “Over the course of time, considering the huge cost and timelines involved in procurement we moved towards indigenous development of spacecraft systems in India. During this phase, I could clearly notice the cost advantage of developing systems in India and offering solutions for the rest of the world,” shares Nekkanti. Soon after graduation, Nekkanti was very keen to launch India’s first private space firm in 2010, but he couldn’t launch it due to lack of required support, team members. He then chose to further pursue higher education in the space domain and therefore, moved to Europe. “I was a part of the Erasmus Mundus Space Master programme, where I studied in three different countries with a group of space enthusiasts coming from over 25 countries,” he recalls. Nekkanti worked on a variety of space projects in Europe and Asia. His main areas of research included Interplanetary Small Satellite missions, Ground Station Networks for Small Satellite missions and Scientific Ballooning for Planetary Exploration. His stint with SpaceMaster helped him connect with right business partner – Narayan Prasad, where they decided to return back to India and take a step further to give shape to Dhruva space. Though Nekkanti and Prasad come from an Engineering background, they always felt the need for someone from an Economics background to fill in the gap. Abhishek Raju came in as their third partner and became the chief strategy officer of Dhruva Sapce. After that, they streamlined their business model to focus on Satellite Assembly, Integration, Testing and Operations. “We did a brief exercise of pitching satellite based and ballooning based solutions to the armed forces in India, but considering the policy hurdles within various government agencies, we couldn’t make much progress,” elucidates Nekkanti. 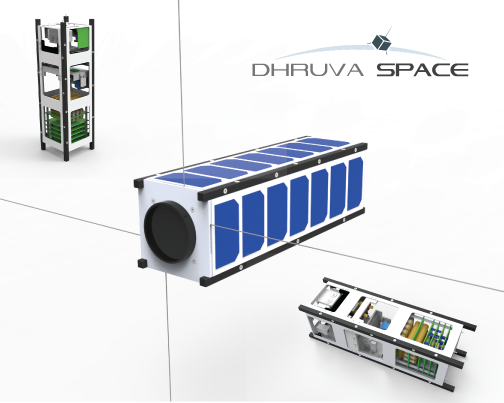 Currently, Dhruva Space has two projects in pipeline – the first one being the Hamsat-2 mission, where Dhruva Space is responsible for the spacecraft design and development, and in another project, the startup has signed a MoU (Memorandum of Understanding) with Berlin Space Technologies for joint development and manufacturing of earth observation micro-satellites in India. “The operations in India shall utilise the current strength in the Indian market and bring frugal nature of Indian space technology based solutions to a global scale,” points Nekkanti. Berlin Space Technologies is a specialist for small satellite systems and technology, currently developing a micro-satellite for Singapore and offers reliable cost efficient solutions for high resolution earth observation with up to 1.5m GSD on the global market. When both partners landed in India to start the venture, the duo did not have a clear idea about the business model. They then started evaluating various concepts, contemplated different ideas and turned-down the ones that failed in a bid to figure out the right model. Personalities like Ram Mohan (VU2MYH), Asshar Farhan, Mahesh Murthy, Sridhara Murthy, Prof Loganathan, Dr Krishnaswamy, Dr Sambasiva Rao, Prof Agarwal, Prof Venugopalan and Dr Sriram helped them gain clarity on how space business could be done in India. Further, the inputs which they received from their friends from Berlin Space Technologies, Spire, Gom Space, Tyvak Systems and SSBV acted as a catalyst to evolve good business model. 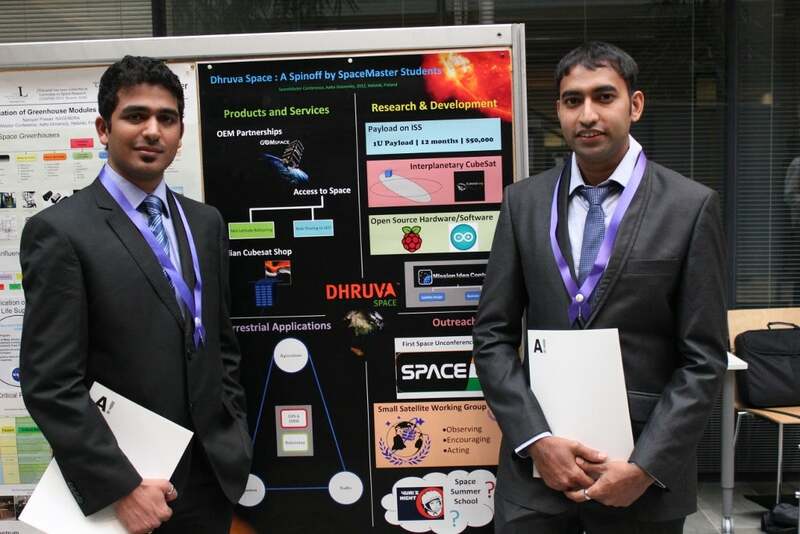 Nekkanti and Prasad started Dhruva Space with a small capital, which they have saved from their scholarships in Europe. Building a business around space is something un-conventional and therefore, getting investors on board was a difficult task for them. But with Nekkanti and Prasad’s experience of doing a high altitude ballooning experiment in Sweden helped them overcome the situation. 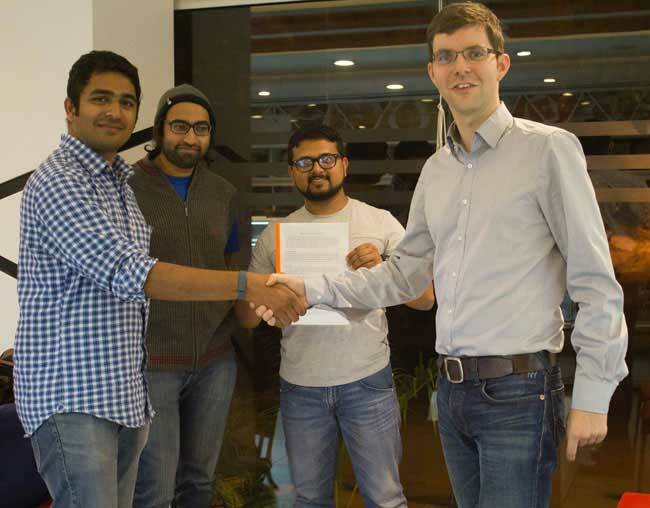 “We built an MVP and showcased our capability to them, which led to signing the first customer to offer near space solutions as services,” recalls Nekkanti. Non-transparency in policies also posed major hurdles, when it came to setting up a business around drones and satellites. “We are constantly working towards achieving clarity in regulations for our business and with the new government in the centre, we expect further ease of doing business,” he adds further. Being a space venture, the team at Dhruva is very selective when it comes to recruitment. Preference is always given to someone who has built systems that are already in orbit or the person should be an amateur radio operator or developer. “I am an amateur radio operator myself and we have a policy within Dhruva Space that people looking for career options with us should either be an amateur radio operator or should have built systems that are already in orbit,” points Nekkanti. Currently, the firm has a small team of around 14 people with about three of them working full time and 11 others, which includes interns and consultants working on a need basis. Over the next few months, they plan to mobilise a small workforce. The different divisions that they are currently contemplating include Operations, Analytics and Manufacturing. In November 2014, Dhruva Space joined hands with AMSAT India to develop HAMSAT II, successor to HAMSAT VO-52. “HAMSAT-1 (VO-52) succumbed in Space on 11th July 2014, while she was on her 49,675th orbit, due to the failure of on-board lithium ion batteries that have met their end of life. As of 21st July 2014, Hamsat-1 (VO-52) has been officially decommissioned by ISRO,” says Nekkanti. Given the fact that AMSAT-India is the only non-profit private organisation in India that owns a Space Asset, Nekkanti and his co-founder initiated discussion about the potential of building HAMSAT-2 at the Antariksh 2014 - Indian Space Technology and Robotics Symposium held in BMS College, Bangalore. In early May 2014, AMSAT-India and Dhruva Space also presented a proposal to ISRO for building HAMSAT-2, where Dhruva Space would contribute towards spacecraft development and AMSAT India towards payload development. Further, National Institute of Amateur Radio also acted as a helping hand for Dhruva Space. “While working on SRMSAT mission, I got introduced to the world of amateur radio. Amateur radio as a hobby inculcates scientific temper and promotes the growth of an individual on a technical front,” shares Nekkanti. Thus, Dhruva’s partnerships with AMSAT-India, Amateur Radio Society of India, Indian Institute of Hams and National Institute of Amateur Radio played a crucial role in deepening the team’s knowledge about terrestrial radio communications, satellite communications and planetary radio experimentation. Is satellite business a sustainable model? In the years to come, there will be more players who would want to venture into the space business arena, and there is enough scope for various other players to grow in the ecosystem that is budding right now. Sustainability and scalability is crucial for the success of every business. Dhruva Space believes that although a good product strategy will not reap benefits in the short run, they are very beneficial in the long run. Over the next two to three years, Dhruva Space is likely to set up their own manufacturing facility and launch their technology demonstration satellites to evaluate the in-orbit performance. Based on the performance, the satellite developer would start working towards building a constellation of satellites. “We have a long way to go and we believe that over the course of time, we will develop certain strategies that will help us sustain at global level,” concludes Nekkanti.